I haven’t read this book yet, but the part about routines completely matches my experiences this year. I’ve been doing a “happiness project” (based on Gretchen Rubin’s The Happiness Project) and my first month was dedicated to getting in healthy routines like flossing and exercising. I’ve found that by setting and keeping small, regular resolutions, I’ve been able to push myself to follow through with a lot more, because I know I can! I will definitely check out this book. Thanks! Another book you might be interested in is Change Anything; it talks about the factors besides willpower that can affect our success in changing. Thanks! I will add that to my Want-to-Read list as well! I’m so glad you found the book so useful that you’ll be talking about it more that once – that’s certainly a great endorsement! 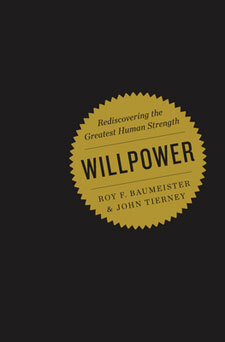 Interesting that by working on unrelated things, we can help our willpower in other areas. The part about flossing jumped out at me. I floss my teeth regularly, but I’ve never thought of myself as particularly disciplined. That one example has made me look at my motivation differently, specifically, why I’m so motivated to floss my teeth and not, say, file papers away. Thank you, Erin, very interesting! At the risk of sounding woo-woo, I have made a lot of progress in my life and level of willpower with things like social anxiety, eating snacks, exercising (which is tough for me since I have a muscle wasting problem that makes anything more than walking pretty painful), etc., by learning how to “hypnotize” myself at night before I drop off the sleep. I got a book from the library to learn it and basically I listen to a metronome set at 60 bpm for 20 minutes, think how relaxed and peaceful I am feeling, and then imagine myself doing what needs to be done. I am lifting weights and loving it! I am eating edamame and not cupcakes and loving it! I am smiling and saying hello to strangers and loving it! It sounds kooky, but it is working for me very well. I feel happier and more in control of my behaviors now. If I feel anxious about something coming up I do my ritual of experiencing it beforehand and having it work out well and can tackle so much more that I used to be able to. Erin, I save many of your columns and it would be helpful if you would put the main topic in the subject instead of just unclutterer. We already know its you by the address. Then, I would know where to find the one on the book Willpower when I want to refer to it. Just saying it would be helpful.